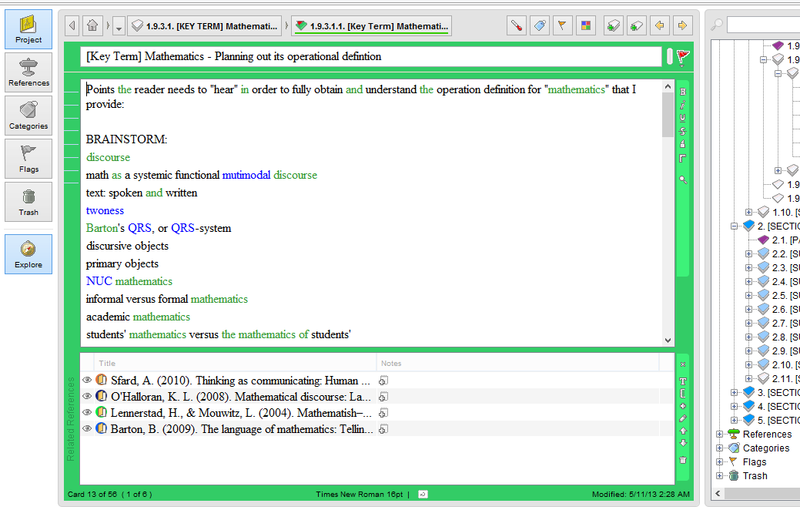 Major Academic Reading and Writing Workflow Revision: Introducing Idea Mason into the Flow! It’s been awhile since I last posted (major writing deadlines). I hope you’ve been well! Well, while doing a search of the forum at Phinished.org, I accidentally came across a program named Idea Mason. 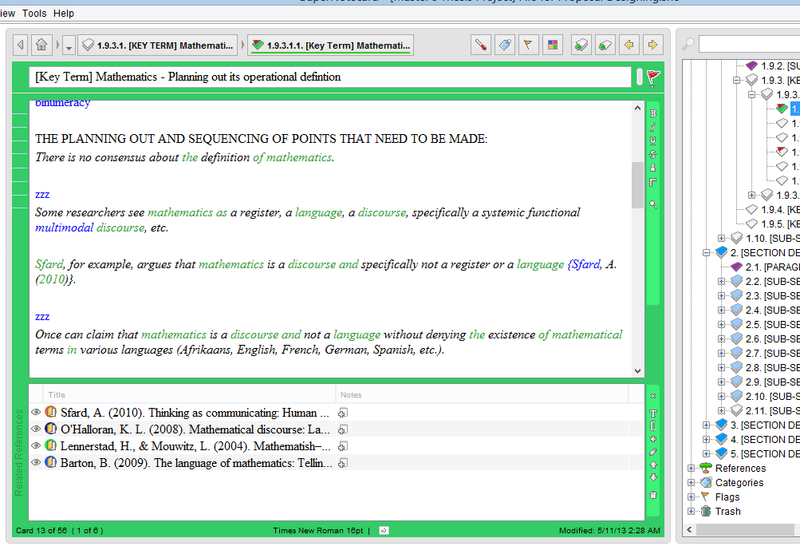 Their website is at http://www.myideamason.com, and Idea Mason is basically academic-tailored Scrivener PLUS! Once you get the hang of it, it just about ELIMINATES the need for Scrivener and Citavi–the latter which in my opinion is the best note-recording and quote-recording bibliographic reference program available. Note: In no way do I mean to knock Citavi. It’s WONDERFUL. I only mean to say that within an academic workflow that includes Idea Mason, Citavi will be redundant. So here is my revised workflow as of June 4th, 2013. First I list the components, and then I very briefly describe the workflow. Please feel free to comment or email me with comments or questions. As always, happy thesising, dissertating, and journal articling! Penzu: for journaling. I pay $20/year for the option of having multiple journals, and I have a Master’s Thesis Journal, a Future Research Ideas journal, a Diary journal, a Prayer Journal journal, etc., etc., etc. Some people say that TYPING is not the best form of journaling–that handwriting activates a type of thinking that allows for better journaling. I wouldn’t know! But, I do have a Livescribe Smartpen that allows me to write by hand but attach voice recordings to the writing. I can then upload them to the computer or Google Docs or EverNote or MS OneNote. When I tap on the page with the pen, it plays whatever was recorded at the time of writing. At first I was going to use it as a research data gathering tool. That study didn’t pan out, so now I use it ESPECIALLY for recording my discussions with my advisor and when my writing is being reviewed by my writing group. LiquidPlanner: for project, task, and time management all in one and integrated; for creating a Gantt chart that functions like a reverse calendar (the Gantt chart automatically updates as you log time into each task); for logging time for each task; for adding notes and comments to each task; for creating checklists for each task; etc. (Aside: If you need to keep up with contacts and your email does not suffice, you may prefer something like Cobalt or Mavenlink. I don’t know.) Liquid Planner has a free education-use subscription for which you can apply. They process that request pretty fast. *** Kanbanflow.com is REALLY nice, too. It supports the Pomodoro technique (i.e. the doing and tracking of “tomatoes.”) However, it is ONLY via LiquidPlanner that I have learned how long I’m REALLY spending on tasks. In LiquidPlanner you enter a time range estimate for how long it’ll take to do a task. Then LiquidPlanner puts it all together to determine a final completion date for the whole project. I was estimating 1.5 hours to read and annotate an article. Then I would select the task and push “start” on the timer each time I put in work for the task of reading the particular article. O. M. G! I was spending more like 4-6 hours on every article. No wonder I couldn’t ever set realistic deadlines. I learned two things: Need to be more efficient with my article reading. Need to allot more time in my provisional time table for article reading! My workflow is from SuperNotecard to MS Word to Idea Mason back to Word. As I mentioned, I was relying VERY heavily upon Citavi (Windows only) for managing citations . . . and for quote-recording and note-recording, and near-perfect auto-generation of bibliographies of only works cited. I still use it SOME to format a reference citation. However, I recently accidentally found a mention of Idea Mason at PhinisheD. Again, Idea Mason is like an academic writing -tailored combination of Scrivener and Citavi. (Whoot! I mean, AMAZINGLY AWESOMELY PHENOMENAL!!!) So I no longer use Scrivener, which I used to use religiously to help me manage my writing (Scrivener allows you to break up a very long draft into component sections and subsections). Instead, I do my writing designing in SuperNotecard, export unpolished paragraphs and subsections from SuperNotecard to MS Word for polishing, copy polished subsections from MS Word into Idea Mason, handle the citations there in Idea Mason, and then dump to .rtf so that I can do final edits in Word. I think Idea Mason is designed to allow you to SKIP SuperNotecard completely. For instance, you could create an Idea Mason document named “Outline of My Methodology Section” and one named “Unpolished Draft of My Methodology Section” and one “Final Draft of My Methodology Section” — each subsequently built off of the former. Well, that’s it! That is the update to my workflow. And that is as simple and streamlined as I’ve ever gotten it. Others go waaaaaaaay less techy and handwrite when it makes sense for them to do so. So! How is you€r workflow these days? Does it flow? What’s your wish list for your workflow? If you use or have trialed Idea Mason, what do you think of it? What’s your wish list for Idea Mason? This entry was posted in academic workflow, Citavi, effectivness, efficiency, Idea Mason, note taking, productivity, PROJECT MANAGEMENT, Scrivener, software product, task management, time management, writing by Z. Sanders. Bookmark the permalink. Hi, Karthik. Thanks! I tried to change citation styles in Idea Mason, and it was limited (did not include AMA). I went to Idea Mason’s website, and this is what it said: “Supports MLA, APA, Harvard Citations (both UK and Australian variations supported), Chicago Notes-Bibliography, Chicago Author-Date styles for both bibliographies and citations.” In my experience, the Idea Mason developers are very supportive. If you write them and request it, they may add in AMA citation/bibliography style support. IdeaMason looks awesome, but it’s only available for Windows… Did you by chance come across something similar for organizing/writing on a Mac? I have not yet found anything similar to Idea Mason for Mac, other than Scrivener. However, if you really wanted to run Idea Mason on a Mac, you could. You would just need to run Windows parallel. And, there might be something out there that is similar to or better than Idea Mason for the Mac. I just haven’t encountered it. Best wishes for your endeavors, James!